Let Us Custom Design Your Soapmaking System Today! Why Should You Have The Proper Tools? How important are the tools of your trade? Why is the proper equipment critical? Say you have 10 small tray molds that you paid $250 for and they make 400 bars, a few months later you have more new customers and you need to double this. Do you spend another $250 and plug the gap or do you see, this is going nowhere? If you grow and hopefully you are planning to, eventually you will be forced to change. Maybe it would be better to look at making it easier to grow and finding a more profitable way to supply your customer base. What about your own time in dealing with an inefficient method? Is it worthwhile to make, 10,000 bars, twice as fast, over the course of a year….a month? Can you take this time and focus it into sales? Would it be worthwhile? All you have to do is consider the role tools have played in the advance of our species. There are many, things that can boost production, save time, make life easier. TOOLS are to us what claws are to a lion or speed is to a gazelle. A broken claw on the fore paw of a lion is a loss of 10% of it’s probability in having lunch that day. We as humans have the advantage of going beyond what we were born with. The invention of the wheel definitely increased our status in the scheme of things but imagine how much quicker things moved with the rubber tire. This is where Willow Way can help. Once you have established the main system components, it is easy to step up production and volume without having to make major, formula, method and equipment changes. The last thing you want to do is change your production methods every time your needs increase. 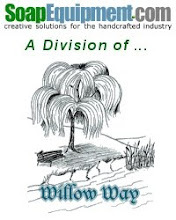 With a Willow Way system, going from 600 bars per day to 1,200 bars or 2,000 to 4,000 is a snap! Why these materials and methods? First off, we have extensive experience in wholesaling, CP, M&P, Liquid and HP soap. Producing large quantities forces you to invent and experiment. We have tried it all and the resulting processes and materials won out time and again. Why don’t you use wood? Won’t last; soaks up oils and retains contaminates, wood breaks down. It is grainy, splinters, warps, and is difficult to clean. Why not use silicone liners or molds? Silicone is expensive to replace. It tears and breaks down over time. It can shrink if not taken care of. It retains scent and must be washed periodically. Silicone does little good on large block pours since soap sticks to about everything. Overall, to the Professional SoapMaker it is inefficient and not cost effective. Why not sheet plastic liners? In the long run, it’s slower and sometimes costly. We tried this too but found that they still require a method to hold them in place, and soap had to be scraped off between pours. Wrinkles can occur, soap can slip in behind and lift them out into the pour, ruining entire loaves of soap. First material we tried. Cracks over time due to the oils affecting the molecular structure of the Plexi. To weak for large molds. Why not larger tray molds? Very labor intensive. Top layer of ash has to be scraped off, hence lots of waste, tricky to pour right depth, hard to move right after pour. Poorer saponification than block molds. Per bar, a tray mold is double the cost, both in the initial mold cost and in the production and waste lost. For more information visit our Systems & Design Page.